An elevator trip turned ugly for Jay Z last week when Beyoncé’s sister Solange Knowles violently attacked him. The incident occurred at a Met Gala after party at the Standard Hotel in NYC. A security video shows the three stars and a man who appears to be a bodyguard entering the elevator together, soon after Solange attacks. 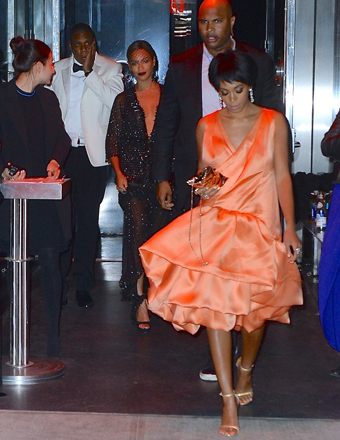 The bodyguard steps in and grabs Solange, but she manages to kick at Jay Z. At one point, the rapper grabs her foot, but doesn’t attempt to fight back. The security guard also appears to hit the stop button on the elevator, probably to keep the argument private. Watch the video courtesy of TMZ. Beyoncé stays out of it, standing to the side. No word yet on the cause of the argument, but a source did tell Us Weekly, "Solange flipped out over something Jay had said, that she took the wrong way. She took it too hard or too far. Not sure what it was, but she greatly overreacted." The trio were photographed leaving the party, with Jay Z tenderly holding his jaw.